Free download XMedia Recode latest version from direct download link. 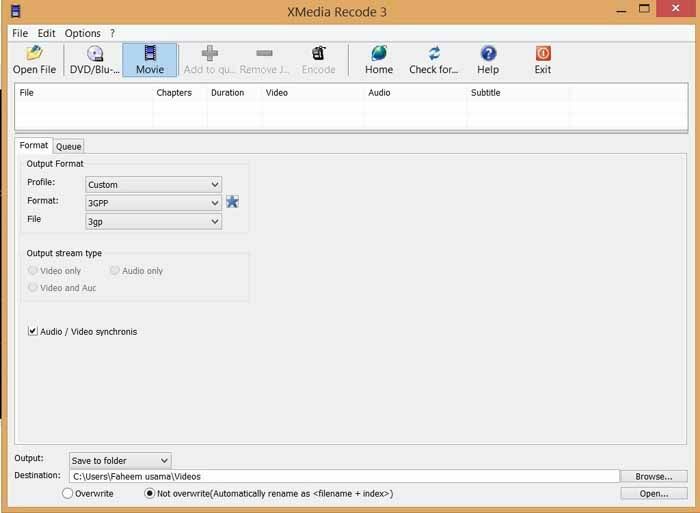 XMedia Recode is a freeware video and audio converter developed by Sebastian Dörfler. XMedia Recode can convert various audio and video formats include all well know formats such as MKV, WMV, MP4, AVI and much more. XMedia Recode is a software application which is designed to help the users to convert audio and video files, targeting both experienced and beginner users with an innovative approach. This app works with most formats out there and this program also has an option that it can convert DVD and blue Ray discs into any format which users like. This program also has the ability that it can import and export many types of files like MP4, WMV, MP3, 3GP and many more. This app can also easily convert unprotected DVDs or DVD files to any supported output file. The feature of drag and drop style interface and uses task queuing and batch processing to automate the job of trans coding multiple files. When multiple videos are selected in the main interface this program supports batch processing. It also supports adding external audio tracks and subtitles files. In XMedia Recode the option of a bit rate calculator is provided which has the ability to capable o sizing videos to fit many media including CD-R, DVD-5, DVD-9 and memory cards ranging from 128 MB to 32 GB. By its use the videos can be calculated to a percentage of the chosen media or a specific file size. This app calculates the video and audio streams together, unlike the most bit rate calculators.